NanoLISA has a limit of detection 5 times more sensitive than the gold-standard of ELISA. 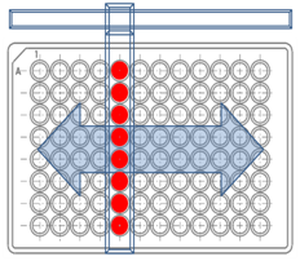 The technique can be adapted for detecting a vast array of common pathogens for which ELISA protocols exist. The instrument is designed to be portable, making the NanoLISA biosensor an invaluable tool for emergency response field work and use in developing countries. Anticipated completion of NanoLISA is late 2013. Current methods of pathogen detection rely on ELISA , which has a limit of sensitivity about 10 pM of highly fluorescent agents, and often requires several days for culture. The present prototype of NanoLISA biosensor is 5 times more sensitive using gold nanorods. The next generation of the biosensor design employing silver nanorods, as well as the light delivery, can be tuned to further increase sensitivity by an order of magnitude. 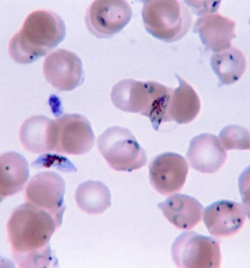 The technique can be adapted for detecting a vast array of common pathogens for which ELISA protocols exists, such as Malaria, HIV, Hepatitis (A, B, or C) and Herpes Simplex Virus. Through NanoLISA, measurements are performed without the need for lengthy multiplication process in culture. The instrument is designed to be portable, and is not limited to use in a lab setting. This makes NanoLISA biosensor an invaluable tool for emergency response field work and use in developing countries. Questions about development of our NanoLISA biosensor? Sensing means sensitive detection and measurement of biological materials in biomedical systems. Our company develops optoacoustic nano-biosensor technology. A biosensor is an analytical device for the detection of micro-organisms, cells and cellular molecular components such as protein receptors, antibodies, nucleic acids, enzymes (such as gamma-glutamyl-transferase) and analytes (molecules present in tissues, such as glucose). Our NanoLISA biosensor combines a nanobiological component with a physical detector . This biosensor uses an immobilized bioreceptors at the bottom of microwell-plates that selectively attracts target biological materials. The nanobiological component generating signals is represented by gold (or silver) plasmonic nanoparticles conjugated with vector molecules for targeting specific proteins on cells or micro-organisms. The physical detector is an ultrawide-band ultrasonic transducer, which possesses exceptionally high sensitivity for detection of optoacoustic signals generated by laser pulses in plasmonic nanoparticles. Figure 1. Principle schematic diagram of biosensor NanoLISA for analysis of blood for the presence of pathogens. 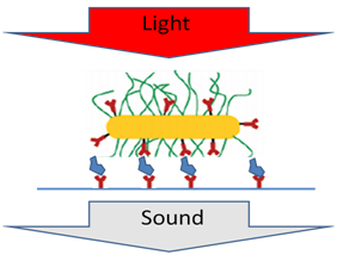 Optoacoustic nanobiosensor NanoLISA utilizes the phenomenon of surface plasmon resonance (SPR) in optical absorption. An important property of elongated gold and silver nanoparticles, such as gold nanorods (GNRs), nanostars, nanotriangles to strongly absorb optical (laser) radiation in the near-infrared range, about 1000 times stronger than Indocyanine Green (ICG) and other NIR dyes and about 10 times stronger than symmetrical SPR nanoparticles, such as spherical nanoshells . Figure 2. 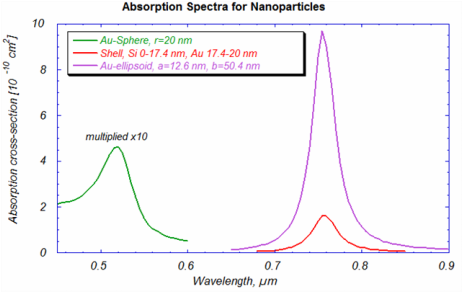 Optical absorption of GNRs is much stronger than that of nanoparticles made of organic dyes with equal volume. 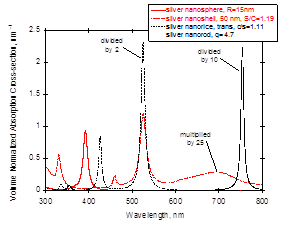 The optical absorption of silver nanorods (Ag-NR) is an order of magnitude stronger that of GNR. Gold nanorods can be produced with an accurately controlled aspect ratio, which permits fine tuning of their NIR absorption peak to a desired wavelength (700 nm to 900 nm for optoacoustic sensing. We have demonstrated that a very small concentration of gold nanorods produces a measurable signal . Effective bioconjugates have been found to link gold nanoparticles with cancer-specific antibodies, enabling detection of rare cancer cells in the blood . Other applications, such as detection of harmful micro-organisms (bacteria and viruses) are under development. 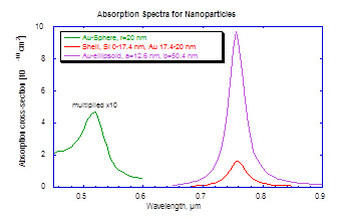 In addition to the strong resonant absorption, the peak wavelength of SPR spectrum is sensitive to nanoparticle size, shape, and local (about 10-20 nm) external dielectric environment. This sensitivity of the SPR to the nanoenvironment allows us to develop a new class of nanoscale biosensors . Our nanobiosensor technology becomes more refined and reliable, so it will eventually make its way from our labs to the clinic. 1. Alexander Oraevsky, P. Mark Henrichs: “High contrast optoacoustic imaging and sensing using nonoparticles”, US Patent # 07,500,953, PCT Application # 10/764,213, 01/25/2003. 2. A.A. Oraevsky, A.N. Oraevsky: Plasmon resonance in ellipsoid nanoparticles, Quant. Electron. 2002; 32(1): 79-82. 3. A. Conjusteau, A. Liopo, D. Tsyboulski, S.A. Ermilov, W.R. Elliott III, N. Barsalou, S.M. Maswadi, Randolph D. Glickman, A.A. Oraevsky: Optoacoustic Sensor for Nanoparticle Linked Immunosorbent Assay, Proc. SPIE vol. 7899: 789910 (2011). 4. A.A. Oraevsky: Gold and silver nanoparticles as contrast agents for optoacoustic imaging, Chapter 30 in “Photoacoustic imaging and spectroscopy”, ed. by L. Wang, Taylor and Francis Group, New York, 2009. 5. Vo-Dinh T, Kasili P, Wabuyele M. Nanoprobes and nanobiosensors for monitoring and imaging individual living cells. Nanomedicine. 2006 Mar;2(1):22-30.